any idea about the maker's period? and for Value where should i go? Hi, thanks for the additional pictures. After looking at the writing I would think it possible that the items could be second quarter of 20th century, or even perhaps ten years later. I could not find a cyclical date as it is frequent in earlier such porcelain, where the porcelain painter signs. Instead it is written that it was made in Zhushan by "manufacturer's name". 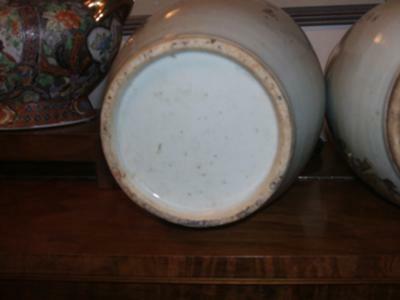 As the writing style as well as the "manufacturer's name" is different on both vases, it is clear that the two vases were not a pair, originally, as I assumed. 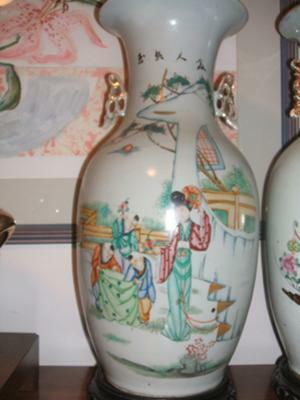 This type of porcelain is probably getting more sought after as collectors of Qianjiang and similar porcelain decorations of the republic period gain popularity. 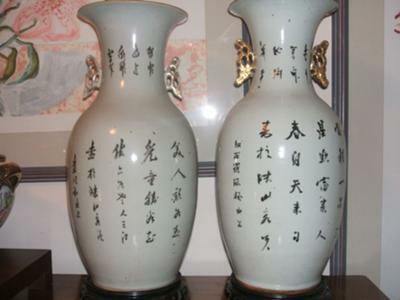 Hi, I had hoped you would let me see the left column of the writing on the back also, to check if the vases are dated. From these pictures alone I assume it is about second quarter of 20th century. 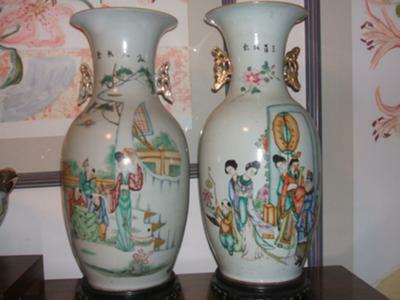 The vases look as if they were not a pair, originally, but probably are from about the same period. The images are too small. If you want me to view them more closely, please either upload closueps showing details or, alternatively, upload high resolution pictures to an image site and post the link. From these small pictures it seems these are repbublic period vases. The writing in the column to the far left sometimes contains a cyclycal date.